Ag Venture is a day where young children get to learn about agriculture the best way possible– on the farm! Interactive stations are set up for local Bay County elementary students where they spend 20 minutes learning about different commodities such as Peanuts, Apiculture, Forestry, Chickens, Apiculture, Vegetables, and Blueberries. As part of the Ag Ventures, Bay County Farm Bureau introduces the Embryology Project. 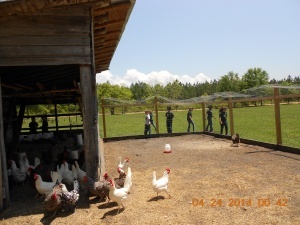 The project allows children to learn first-hand, which came first, the chicken or the egg! They get to see the transformation of the eggs into chicks or chick embryo development. Students learn about the proper handling, care and how long it takes the eggs to turn into peeps. The project ends 21-23 days after the hatching period, the students get to see the eggs hatch, meet and name the chicks. Teachers and parents traditionally adopt the chicks.